The E-quip.Us Store is completely new. There is no old store, so there’s no risk of anyone saying, I wish they hadn’t changed _______ (whatever). But a few helpful words are in order. AND… I must admit operator error on the Launch Helpers reply link in yesterday’s post. A better version is included in this post – please feel free to share it! Now, on to the store! Why have an online store? What is in it? Why is that important. Those are all good questions to ask and answer. So let’s start with the Why? question. One answer is good stewardship. Really! Your faithful support enables many things. As I have mentioned multiple times in recent posts or emails, your support enables me to create study materials that have proven a blessing to many. And that trend continues. So I would be remiss not to say Thank You as I mention that. So making the most of what your support has made possible is a matter of stewardship. We don’t just use things once, pitch them out, and start all over. It’s really quite the opposite. The materials get refined, edited, added to, taught for the second or third time (different groups, locations), and revised upward. Along the way, some of that work winds up on the blog page. But most of you already know that last point! And we have the tools to turn these resources into books. In turn, that opens up some other opportunities. First, the books can be good equipping tools for ministry members. Second, the books can be made available to individuals and/or churches who don’t currently support this ministry. Ministry leaders are always looking for good resources. This is another way our members extend an equipping ministry to others. The comments above only address resources created through this ministry. However, there are many other helpful equipping resources available in today’s world. And the world has changed a great deal since any of us had to go to a bookstore to buy a book. Let me use one word: Amazon. We are all familiar with the online shopping giant. What you may not know is one of the things that contributed to their growth and success. Every product in the world has a marketing cost built into its price structure. One huge innovation by Amazon was to take advantage of that fact. And rather than pay the traditional marketing fees to the traditional middle men, Amazon allowed website owners to market Amazon products on their own sites. Traditionally, the price for any given product was the same whether it was found on Amazon or some other site. And Amazon just paid part of the marketing costs to the websites that advertised their products. This whole process has a name. It’s called Affiliate Marketing. For some time I have posted Reviews and Recommendations for readers. I included links to recommended resources (usually books) in my blog posts. Any one of my readers could click one of those links and buy whatever I was recommending at the Amazon price. The price wasn’t marked up on this site. But those purchases would return a small amount to this ministry (usually one dollar or less per purchase). That doesn’t sound like a lot, but it can add up depending on the number of readers or subscribers a site may have. So there will be a number of reviewed items (with Amazon links) in the E-quip.Us Store. It’s just another way to fund ministry. The items above really address this point, too. But the need for the store points to another goal in remaking the website. The base of volunteers and the support base needs to expand. Fund raising is a requirement of what we do. That said, I’ve never considered myself very good at it. So it seems a good idea to me to just ask people to partner with us in the Biblical mandate to equip saints for the work of the ministry. That is easily recognizable as a divine imperative. So if we do it together we working alongside each other, encouraging one another, and demonstrating obedience. It seems like a win all the way around. To encourage people to engage in this ministry, and to equip themselves to be better ambassadors of Christ, many of the resources found in the store will be free or heavily discounted to supporting members. That’s it for the store (for now!). Questions/suggestions? You know what to do. OKAY!!! For those that responded yesterday, I apologize. Please respond through THIS LINK and it should all work just fine. And, feel free to put this post on your social media sites. Email this post to a friend. That’s how we get more folks involved. Have fun. A website launch is no easy task. It’s not as big as the launch pictured here! And everyone knows there were hundreds or thousands of hands involved in launching the shuttle. It wasn’t just the finger that pushed the button! And that’s how it needs to be with a good website launch. More about that below. First, let’s finish up the discussion on the post categories on the opening page (new website). The previous post covered the first four groupings of posts on the opening page. This post addresses the remaining four. As you can see, there is a brief description of each grouping below the corresponding graphic. Believers need to be equipped (and well practiced!) in prayer. Clicking on this icon will take you to posts on the subject of prayer. Insights posted here can equip you and/or help you equip others. Remember, I am not the only equipper here! The eyeglasses on the open page tell you what this group of posts is about. I’ve posted several things in the last few months about how to study the Bible. In part, that was done in anticipation of this feature of the new website. But the bigger picture is the need for this kind of instruction. Please do no wait on me, your pastor, your small group leader, or anyone else to unpack the Word for you. Be as skillful as you can in this area. That doesn’t mean we won’t gain insight from the study of others. We will. But we need to dig for ourselves. We learn more that way! This grouping of posts will almost always be ‘open’ for viewing, i.e., not a members only section. Why? When we have mission volunteer teams on the ground (wherever that may be) we want anyone/everyone to be able to see what is happening. When people can see the work going on they know what they supported, how their prayers are being answered, and many are encouraged to join in as a future volunteer. But there is another kind of post that will show up here. We get updates from time to time from friends in far away places. I share those as appropriate and this will be the place to look for all things described as the mission field. And of course, I use that term in its most commonly understood way. We all have a mission field behind our own front door and another one just outside of it! More about that elsewhere. I have found myself addressing cultural concerns. How do we take the truths of Scripture and faithfully apply them to the crazy, mixed up world we live in? Like good study, we need to learn to do that. And when it’s appropriate there will be posts in this thread that help us do that very thing. This could have been titled: Being Salt & Light. You get the idea! If you will be so kind as to help with the launch, please fill in this form. We expect to be done with this by mid-February. The process is to formally announce the site, then promote it, and have a brief sign-up period. We will then close membership in the site for a while. 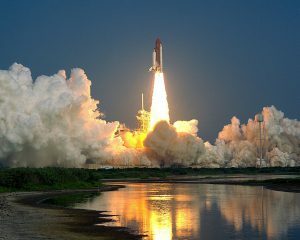 When we open it back up for new members, we will ask for a new launch team. So an agreement to help is NOT open ended! Just thought you’d like to know. Launch helpers register HERE. Coca Cola: the real thing. Dollar Shave Club: Shave time, shave money (I’m a member – good service!). Lay’s: Betcha can’t eat just one. DeBeer’s: A diamond is forever. M&Ms: Melts in your mouth, not in your hand. But for you, me, and everyone who claims the name of Christ, Equipping For Life is much more than a tagline. It is what we are called and commissioned to do. And that divine calling is why the new website is put together around this theme. So this is our second post about using the new site – and when we open the new site these posts will be transferred so they will still be available and helpful. Yesterday’s post addressed the blog’s location in the new website. And even though the complete blog list is not on the opening page, a good deal of it is there. How much of it is viewable will depend on whether or not the viewer is a browsing guest or a website member. But the full membership discussion is for a later post. 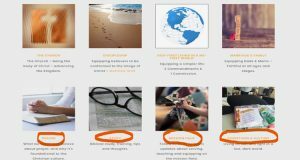 Blog posts on the front page are arranged around eight categories I call life-missions. What God has commanded us to do is our mission. So, how many missions do we have? There are many. I addressed this briefly at the close of the previous post. Here, I’ll address these life-missions more completely. If you have questions, or comments, please feel free to share those below or send an email. 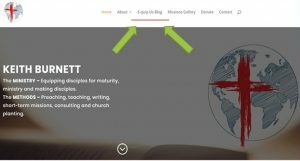 The first graphic is a link to posts/teaching on the Church. This is a life-mission shared by all believers. Why? We are members of the body of Christ, which He named His Church. He is the Head of the body. Scripture has a great deal to say about what the Church is, how it is to function, and what it is meant to accomplish. The problem is we all think we know all that stuff. Let me tell you why I disagree and what we will do about that through the new website. It is my privilege to do some fun but challenging things. I get to study and research course materials to equip pastors and churches. That is possible because people participate with me in this Equipping For Life ministry. They do that through direct support, volunteering, and prayer. One course we worked through is what I entitled, The Essential Nature of the Church. What made it so challenging was my methodology in putting it together. The goal was to define and describe the Church without reference to tradition, culture, denomination, or expectation. If you try that, you will see it is anything but easy. You’d be surprised how often we bring our traditions and/or culture to bear in defining a Biblical concept. So posts linked to this section help equip readers/supporters as effective members of the body of Christ. Every believer is a disciple. The Holy Spirit’s job is to conform each of us into the image of Christ. And since that task won’t be complete until we see Him face to face (it’s then we will be fully like Him), our discipleship-mission is never over. We don’t graduate from discipleship school – well… not as long as we are breathing! So this body of posts would apply to any and all. Jesus had a way of distilling Scriptural truth into memorable, simple ways to live. He gave us two great commandments. We know to love God first and foremost with all of our being, And we know to love our neighbor as ourselves. Jesus also commissioned us to represent Him and His Kingdom in this world. We are to make disciples of all nations, teaching them to obey all that He has commanded us. Wow! That sounds a lot like equipping for life. O wait! That’s what all of us are supposed to do. And that is why your help in this ministry is so essential. I am not the only equipper. We, together, are equipping others. Please keep that in mind. Posts in this section will provide practical insights and application regarding Jesus’ two great commands and His commission. This body of posts will help equip believers who are married. Marriage is God’s idea and His Word addresses the subject. And this mission serves to illustrate the fact that Christians have missions in common but we also have missions we don’t share with others. Some people are single. They might be single again, widowed, or divorced. But the posts can still apply to all. Marriage could be part of the future for ourselves or our loved ones. And it’s much more likely to be a great marriage if we are properly equipped. There are four other sections of posts on the front page. We will address those subjects in the next post. Please let us hear from you if you have comments or questions. New Website – The Launch Is Here! Our website is changing – in many, many ways. Actually, it’s a new website. And we are finally at the place to start making announcements and giving helpful hints for a smooth transition. So this post is the first of several along that line. On the current site, the latest blog post shows up at the top of the opening page. And it has been that way for a long time (too long). The length of time we’ve used the current website has contributed to some of the difficulties in making changes and upgrades. We didn’t want to lose anything in the transition, but the amount of material, data, and/or images was massive. So my note-to-self is not to wait this long before upgrading the site again! Finding the latest blog post on the new site is still easy. But blog posts do not appear on the opening page. And that is why I thought a picture would be helpful. The featured image for this post is an edited screenshot of the new website. The arrows on the picture address today’s subject. The arrows point to the blog link. You may notice it says: EquipUs. You might also remember I used that term in this recent post. That was intentional, but unexplained. 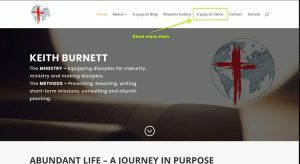 Part of the process of reworking the site was defining its purpose – or, the essential focus of this ministry. Ideally, those two things should be the same. Questions were asked and I am thankful that you responded to them. Your responses and our self-evaluations said this ministry is about equipping. That’s not a surprise since equipping believers is God’s instruction for pastors. In the long process of getting the site ready to launch, I actually bought the E-quip.Us domain name. You will see that name more and more in the coming days. But, for the moment, it is the name we are giving to the blog portion of our new site. The blog now has a name and that name is what we do! More about that below. Those of you who have subscribed to our rss feed get the latest posts in your email. That will not change. The EquipUs blog will still be searchable in the usual ways. But there are some upgrades to help you access Biblical insights and comments on various topics. If the latest blog post isn’t on the front page, what is? Well, that’s what we will cover in the next post! Until then, think about the missions of your life. You have quite a few. I call some of them big-picture missions. They cover all of life for every believer. Then we have those life-missions that are more individual in nature. I share some of those with other pastors because the Word carries God’s instruction for what we do and how we are to do it. That’s an example of a Biblical mission I don’t share with every believer – just those the Father has called as under shepherds. There are many other examples. We used the front page to equip these life-missions. And I’ll get into some specifics in the next post! Equip Us is right in the middle of Acts 16:9. Do you see it? No? Well, read the chapter and see what Paul did in response to that request for help. He equipped believers and the churches. 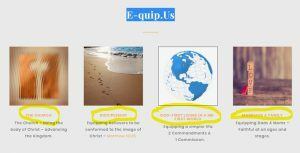 So how do we apply ourselves to a request to Equip Us? What examples do we follow? And why is it important? I’ve mentioned Moses before. But he still stands as a great example to us. He encountered God in the burning bush (see Exodus 3:1-17 ). Moses met God with his staff in his hand. He left that meeting holding the rod of God. Many miraculous things were done with the rod of God (parting the Red Sea, water from a rock, etc.). And Moses was still holding it when he died about 40 years later. What made the difference in a shepherd’s stick and the mighty rod of God? First, note that Moses already had the stick in his hand. God didn’t give him something new when He called Moses to lead God’s people. Second, Moses obediently submitted what he had (that stick) to the will and purposes of God. How? Read it. God told Moses to throw the staff down. It was all Moses had and he let go of it. When Moses picked it up again it was the same familiar stick – but it was also the embodiment of God’s might and power. Our lives seldom differ from that pattern. God only asks for what we have. He then uses what we give Him. And that happened last week! I’ve also written posts about a women’s quilting ministry in Scottsboro. One of their leaders was part of last week’s mission team. Like Moses, they have given what they have to the Lord’s use. They have a skill. And many would doubt (defy?) the idea of using their skills for equipping, ministry, evangelism, or Kingdom multiplication. That’s a mistake! And I’ll show you why. Micah 5:2 – Bethlehem was small, but the Savior was there! Judges 7:1-7 – A small army but a mighty victory. And then there is Matthew 14:7. There we see an insignificant, unnamed boy with fives loaves and two fish. Our Father does multiply what we give Him and He uses it in the most unexpected ways! Those disciples had not made an Equip Us request, but they were equipped that day in ways they didn’t fully realize. And that’s how it was last week in Samana. We don’t yet know the effect and reach of what was done. But experience gives us a way to make some general predictions! The strategic reason to equip pastors and churches in Samana is the cruise industry. Thousands of people from all over the world come to this little place at the beginning of the year. Their purpose is whale watching. How is that important? We can’t do that because we are too poor to go anywhere else. So, you’re exempt from this command because you’re poor? Do you realize that God knows you are poor and He has brought the world to you? To use a phrase, the lights came on! It was something like the famous TV commercial: Wow! I could have had a V-8! Wrap all that up together and you get an idea of the moment. They understood their opportunity and why equipping was necessary. Last week’s mission team was another effort to equip churches for outreach. Teaching ladies to quilt was just one way our team was faithful to equip. But any skill or tool needs to be properly applied in order to be effective for the Kingdom. 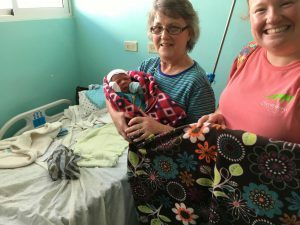 The quilters in Scottsboro make quilts for outreach and ministry. So the application of that skill was also taught. 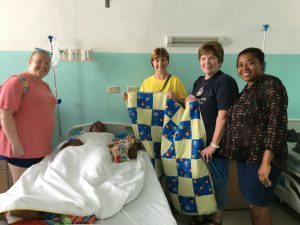 Quilts were taken to the local hospital. They were given, in Jesus’ name, to children, to moms of newborns, and other patients. But that’s not the only way to use them. That skill will be used to make many more quilts. And those quilts will find their way into the hands of tourists. What do tourists look for? They want something local and something unique, if possible. Handmade quilts meet those requirements. But quilts for tourists will also come with a message of God’s love for them. You see, God really can use what we are willing to give Him. 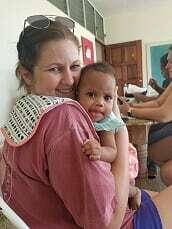 We can’t know all the ways He will use the equipping work we did in Samana last week. But it’s safe to say He will use it. As we continue to minister and equip in this place we will probably learn of ways God used our efforts. And there will be a day when we get to see all the ways our Father used our gifts to Him. I’m looking forward to that! How about you?